It is January 1st. A new year is upon us! It’s time for reflecting on how we live our lives, making resolutions to do better, watching our diet and going to the gym; at least for the next three weeks. In the spirit of the new year I am going to try very, very hard to not post any desserts for the next three weeks. Joking aside I know I could certainly use a dessert detox after all the stuffing my face sessions I participated in over the last couple months. 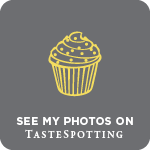 Being the food obsessed person I am I have an extraordinarily difficult time dieting so instead I just try to keep my meals fresh, healthy and flavorful. As I have previously mentioned on Lemon & Mocha I am not a fan of salads resembling rabbit food. However, I find when salads have a cooked element instead of all raw ingredients the texture and flavor is greatly enhanced. 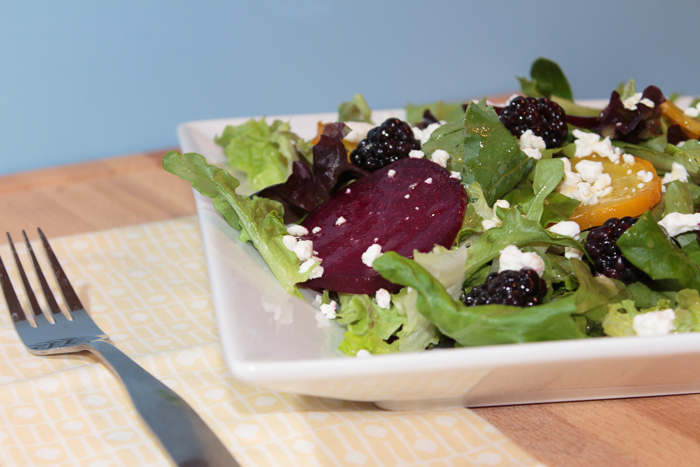 This roasted beet, blackberry and goat cheese salad with an orange champagne vinaigrette packs so much punch you will completely forget you are eating healthy. 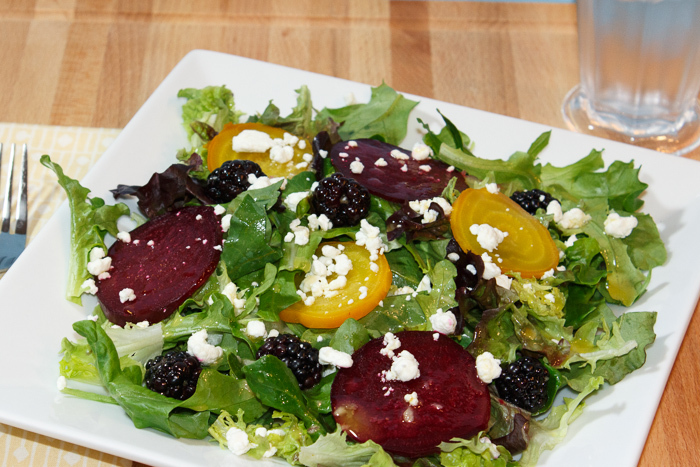 The beets are roasted to mellow and sweeten their flavor as well as sliced thin to keep them from overwhelming the rest of the salad. 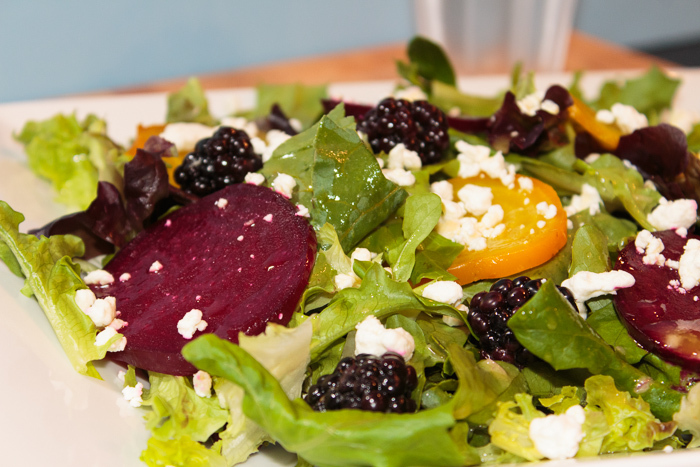 The creamy goat cheese provides a nice contrast to the tangy citrus infused dressing. Serve alongside roast chicken or as a vegetarian main dish for a fresh, flavorful and seasonal meal this winter. Rinse the beets, scrubbing off any dirt, then dry. Tear off 2 small squares of tin foil large enough to encase each beet. Place each beet in a square of tin foil, slightly turn up the sides and drizzle each with olive oil. Lightly season with salt and pepper then seal up the tin foil packets. Bake the beets in the foil packets for 30 minutes. Remove the beets from the oven and set aside to cool. Once cool enough to touch, remove the skins by hand or with a paring knife. Thinly slice the beets. Wash the greens and place in a large bowl. Add the sliced beets and blackberries then toss with some of the dressing. Top with the crumbled goat cheese. Whisk together the minced shallot, orange champagne vinegar, mustard, orange juice and sugar. Slowly whisk in the olive oil then season with salt and pepper. *I got orange champagne vinegar from Trader Joe's, but if you can't find any you can use regular champagne vinegar and add 1 tablespoon orange zest. *Use the leaves from the bunches of beets for the beet greens. Dressing recipe adapted from Martha Stewart. It seems as though New Year’s Eve menus are just classier versions of Christmas meals. Since it’s only a few days later all the same winter and holiday flavors are still relevant. But you want to look festive ringing in the new year so you bust out the champagne flutes, 2014 flashing glasses and the kazoos. See? Classy. I’m here to help you take your regular tasty traditions to the next level. 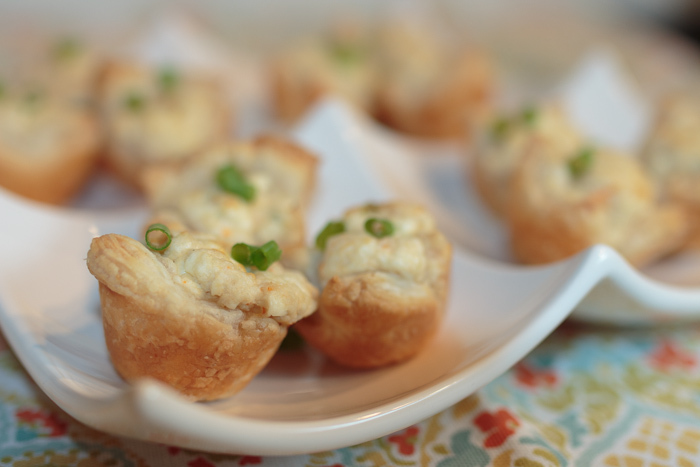 Introducing flaky and creamy crab dip puffs. The original cheesy and addictive crab dip has been elevated to proper New Year’s Eve fanciness. Serve these for any party or gathering and your guests will be both impressed and satisfied. The best part is that they don’t have to know how simple it all was. Squares of pre-made puff pastry are pressed into a muffin tin before being topped with a quick one-bowl dip. The little squares of puff pastry serve as a vessels for the dip and provide a perfect flaky and buttery complement. Topped with chopped scallions for some nice color, crunch and enhanced flavor, everyone will be going back for thirds and fourths. The crab dip puffs can also be made ahead, frozen and reheated in the oven giving you less to do and more time to hang with your guests. 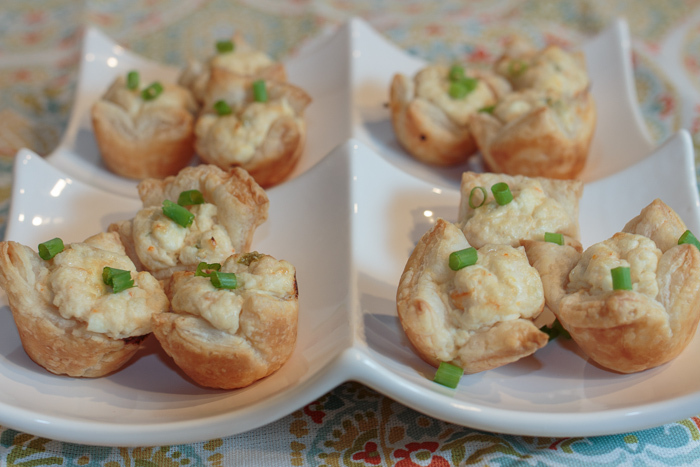 So at your next gathering get fancy with these simple delicious crab dip puffs and remember, pinkies up! Preheat the oven to 400 degrees F. Lightly spray a mini muffin pan with cooking spray and set aside. In a medium mixing bowl combine the cream cheese, sour cream, crab, mayonnaise and seasonings. Set aside. On a lightly floured surface unfold the first puff pastry sheet. Roll into a rectangle about 10" by 15". Cut the rectangle of puff pastry into 24 squares. Press each square into a cup of the prepared mini muffin pan. Bake for 10 minutes then remove from the oven. 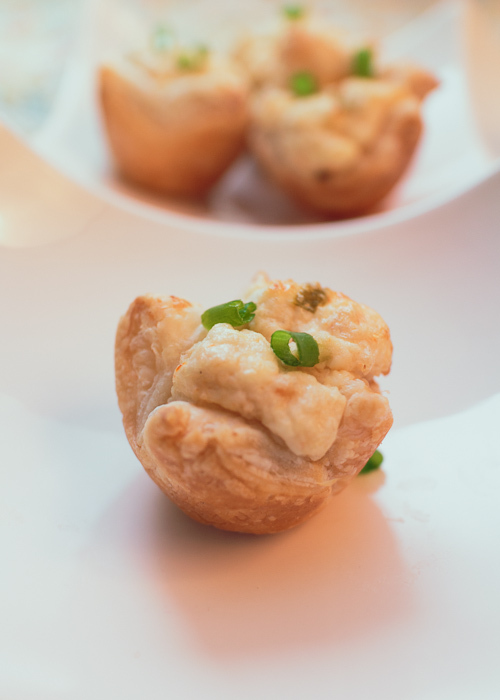 Spoon a small tablespoon of the prepared crab dip into each puff pastry cup then top with half of the reserved cheddar cheese. Return to the oven for another 10 minutes. Repeat with the remaining puff pastry sheet, crab dip and cheddar cheese. Remove from the pan and top with the chopped green onions. Serve hot. To reheat frozen crab dip puffs place on a baking sheet in a 350 degree F oven for 10 minutes or until hot. Recipe adapted from Pepperidge Farms. There are some flavors we really only see around the holiday season like gingerbread and pumpkin. Another one of those flavors is egg nog. Now I think I could really enjoy a moist spiced gingerbread loaf or some smooth pumpkin hummus anytime during the cooler months, but it takes a special time of the year to be in the mood for egg nog. The first time I had egg nog was in the form of a dining hall carton that we spiked with Captain Morgan’s in a college dorm room. I have definitely come a long way since then. 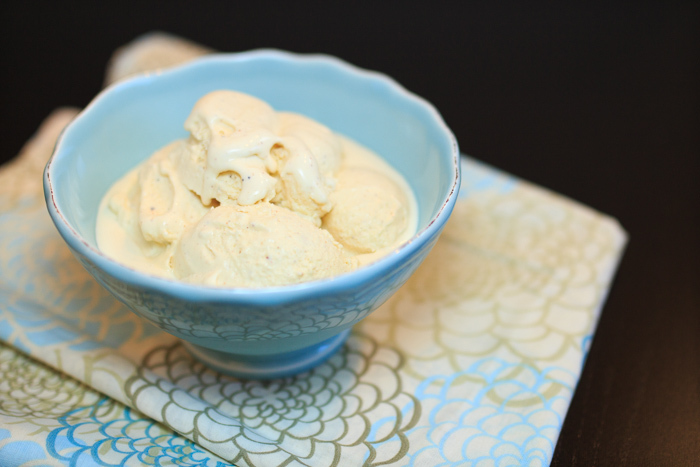 This egg nog ice cream is spiced and sophisticated. But one thing hasn’t changed- this ice cream is boozy. An adult-table-only-make-you-go-woah kind of treat. Sometimes that’s a good thing. Especially on days when your whole family is together from sun-up to sun-down and you’re starting to find yourself going a little kooky. 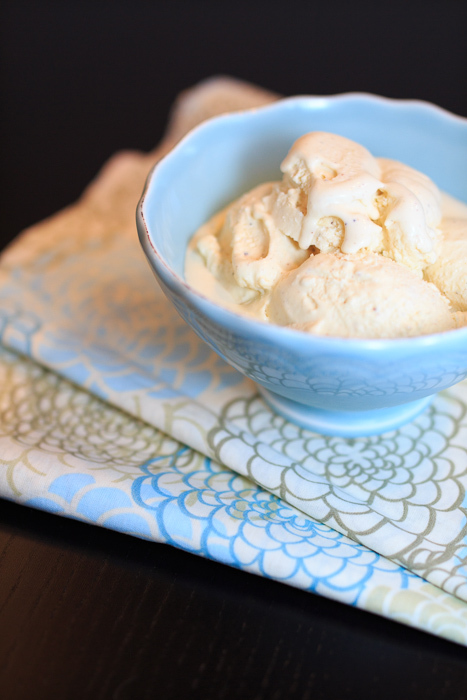 One bite of this ice cream will slap your tastebuds back to reality. Best served to adults alongside a warm slice of gingerbread cake or a pumpkin bread pudding to add a little liquored up sophistication to your holiday desserts. Pour the heavy cream into a large bowl and place a mesh strainer on top. In a medium saucepan over medium heat warm the milk, sugar and salt. In a medium bowl whisk the egg yolks. Whisking constantly carefully pour the warm milk mixture into the bowl with the egg yolks then pour the mixture with the egg yolks back into the saucepan. Stir constantly over medium heat, making sure to scrap the bottom, until the mixture is thick enough that it coats the spatula. Remove the mixture from the heat and let cool for a couple minutes. Then pour the mixture through the mesh strainer into the bowl with the heavy cream. Stir to combine then add the nutmeg, brandy, rum and vanilla. Stir until cool over an ice bath then chill the mixture completely in the refrigerator. Freeze in an ice cream maker according to the manufacturer's instructions. I have a confession to make. I have never made french toast. Well, before today’s post of course. It had been sitting on my kitchen bucket list of fifty things I want to conquer in the kitchen for quite some time now so when Matt suggested making it I decided to rise to the challenge. Except it wasn’t a challenge at all! French toast is so simple that I cannot believe I put it off for so long. 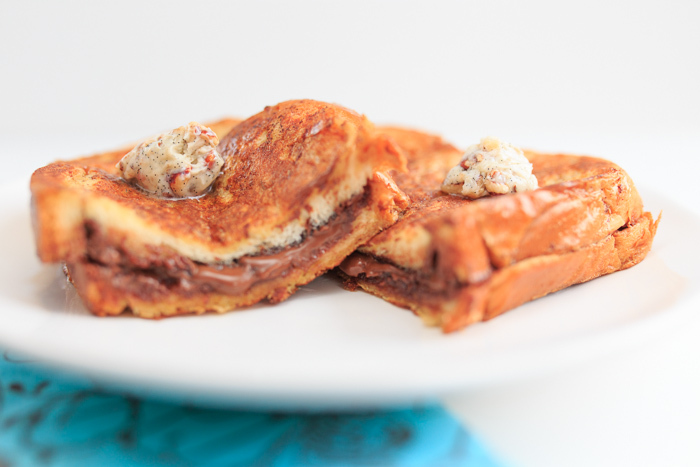 Today’s creation is Nutella stuffed french toast with vanilla pecan butter. I’ll give you a minute to let that sink in. I had a jar of chocolate hazelnut spread sitting in the cabinet after making some other sweet treat I will be sharing with you in a few weeks. I was wondering how we should use it up so I wouldn’t succumb to eating the whole jar with a spoon and asked Matt what he thought we should do with it. 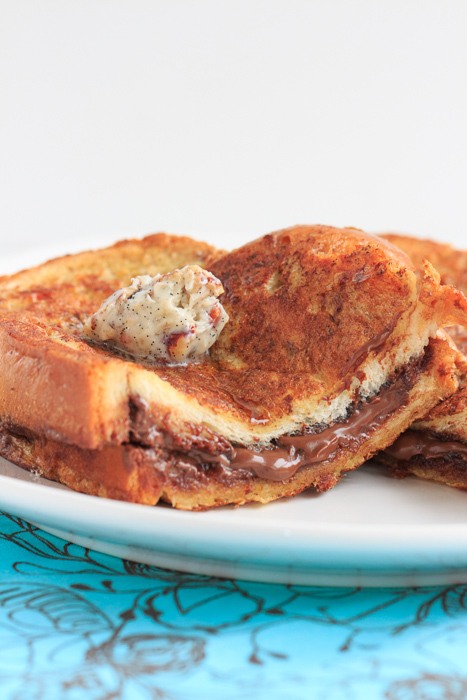 Without hesitation he suggested making Nutella french toast and using up the leftover vanilla pecan butter from the pomegranate brussels sprouts. Genius! See why I love this guy? Well also for other reasons besides his knack for all things delicious and resourcefulness in the kitchen, but that’s not important right now. 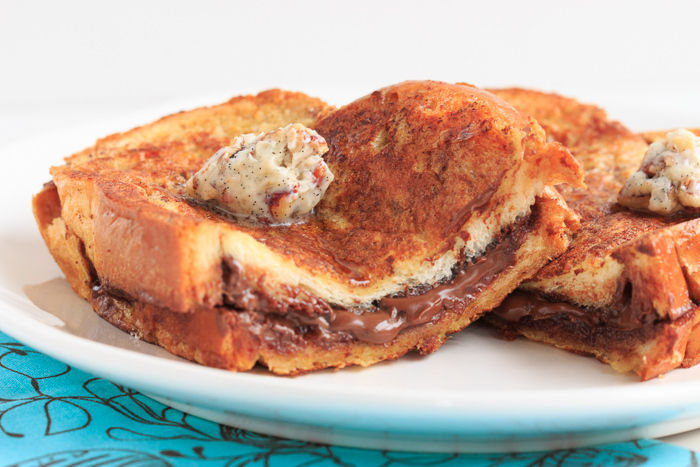 What is important is that you grab some Nutella, crack a couple eggs and start making this french toast right now. Unless of course you’re at work or it’s the middle of the night and you are fresh out of chocolate hazelnut spread. Otherwise you have no excuse! At a friend’s house? They won’t mind if you borrow their kitchen for this dish. Dinnertime? Hello, ever heard of breakfast for dinner? In a canoe in the middle of a lake? Well what the heck are you doing reading my blog right now? I used challah for my french toast, but you can really use any type of bread as long as it doesn’t have a lot of holes. Brioche is a popular choice because it has a high butter and egg content so it adds a nice richness to the dish. 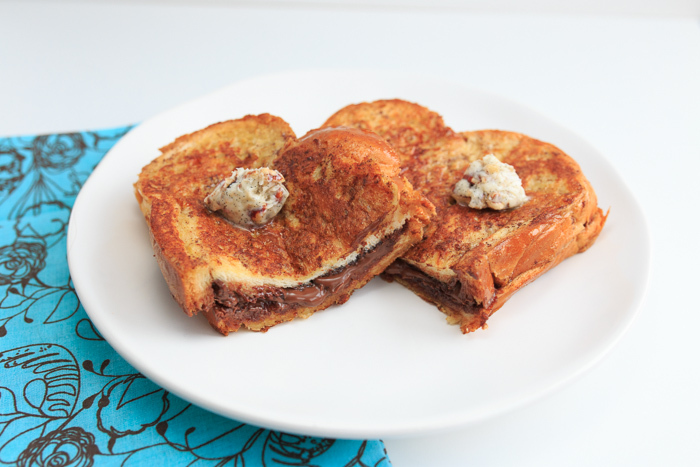 The thick slices of french toast slathered with creamy chocolate hazelnut spread and then griddled until crispy on the outside while still soft on the inside was enough to make me swoon. But then I added the butter speckled with real vanilla bean seeds and crunchy toasted pecans and I was in heaven. Complete breakfast or snack-time-dinner-time-just-not-canoe-time heaven. Enjoy! In a shallow bowl large enough to fit the slices of bread beat the eggs with a fork or whisk. An 8” x 8” Pryex pan works well. Add the milk, vanilla, ¼ teaspoon ground cinnamon and ⅛ teaspoon ground nutmeg then mix or whisk to combine. Heat a griddle or skillet over medium heat and coat with cooking spray or the tablespoon of butter. 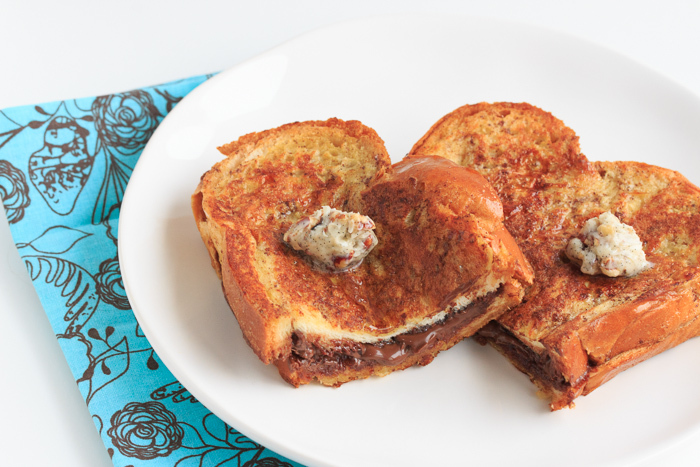 Make a sandwich with 2 slices of the bread and 3 tablespoons of the nutella. Lay the sandwich flat in the prepared egg mixture and let sit for 1 minute. Flip the sandwich and let sit for another minute. Pick up the sandwich and let all the excess egg mixture drip off. If there is a lot of excess egg mixture that won’t drip off push off with the fork or whisk. Place on the heated griddle or skillet. Let cook for 4 minutes, or until brown, then flip. Cook the other side for 4 minutes, or until brown. 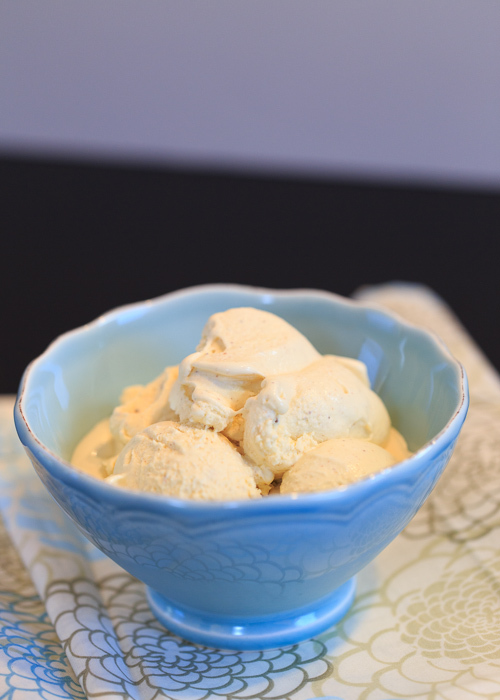 Remove from the heat and top with the vanilla pecan butter. Repeat for the remaining serving. In a small bowl combine the butter and vanilla bean seeds then add the pecans. Stir until combined. This makes a lot of extra vanilla pecan butter. Use it for more servings of french toast, to top pumpkin pancakes or to make the pomegranate molasses brussels sprouts posted a couple weeks ago. French toast slightly adapted from Half Hour Meals.